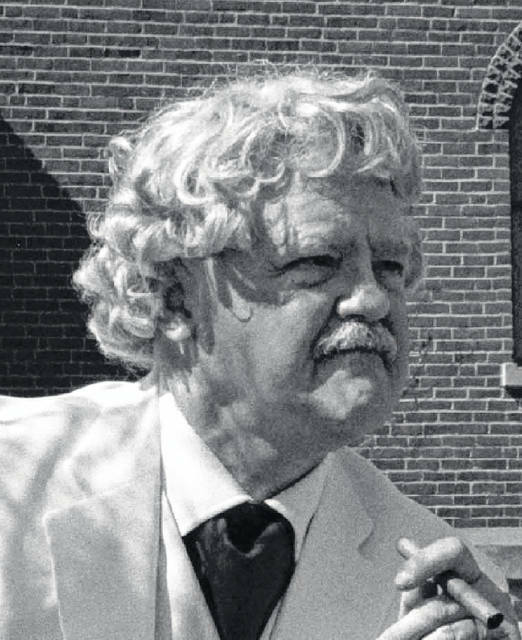 More than 110 years after giving a lecture at the Delaware Opera House, great American writer and humorist Mark Twain will make his return to Delaware — sort of. On Sunday, July 8, professional actor Ken Barnett will portray Twain in a reenactment of the lecture at the Barn at Stratford. The event will begin at 2 p.m., and tickets can be purchased at the door or at eventbrite.com. Tickets will be $12 for adults and $8 for children ages 6-17. The Barn at Stratford is located at 2690 Stratford Road in Delaware. Magician Nate the Great and his sleight of hand magic act will open the show. All attendees will also receive a free gelato courtesy of Ciao Cafe. Barnett, a one-man-show performer, first began portraying Twain in 1977 in a production titled “The World According to Mark Twain.” Since that time, he has performed the act several hundred times throughout Ohio, as well as St. Louis and Chicago. He has since added Red Skelton, Jonathan Winters, and Dame Edna Everidge to his list of portrayals. “A unique blend of biting satire and poignant personal reflection, “The World According to Mark Twain” is one show that you will not want to miss,” said Greg Patterson, Arena Fair Theatre artistic director. The performance is done in the tradition of Barnett’s mentor, Hal Holbrook, who received critical acclaim for his one-man stage show, which he developed while attending Denison University, where he portrayed Twain. Holbrook was invited to perform on “The Ed Sullivan Show” in 1956 and went on to win a number of prestigious awards for various performances throughout his career. Holbrook was inducted into the American Theatre Hall of Fame in 1999. This program is sponsored by Arena Fair Theatre, the Delaware Gazette, the Delaware County Historical Society, Fidelity Federal Savings and Loan Association, and Ciao Cafe. For additional information, visit DelawareOhioHistory.org, email Programs@DelawareOhioHistory.org, or call the DCHS at 740-369-3831, ext. 3. In addition to his Twain performances, Barnett is also a regular star at the Mount Vernon Chautauqua at the Mount Vernon Opera House. Chautauqua was a cultural, religious, and political education movement that became very popular in the late 19th century into the early 20th century. Today, only a handful of Chautauqua communities still survive.